CHASING FOOD DREAMS: Moo Cow Frozen Yogurt: The Science Behind The Divine Frozen Yogurt! 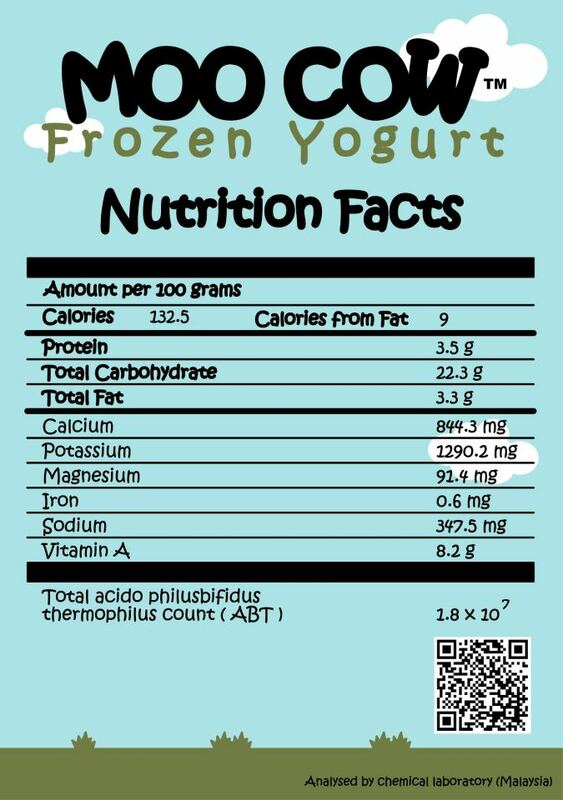 Moo Cow Frozen Yogurt: The Science Behind The Divine Frozen Yogurt! My first spoonful of the soft serve took me by surprise. The ice cream was tangy and so silky with a kick of lusciousness. My sense of taste was immediately awaken, refreshed by the cool tangy and creamy flavor of the soft serve. It was then that I started paying much attention and saw that Moo Cow was actually serving frozen yoghurt (froyo)! Wow, my next thought was how on earth they managed to freeze yoghurt into such a divine soft serve concoction. Someone must be a genius. Indeed that someone had managed to create a frozen treat that is actually healthy and taste absolutely divine. Needless to say after my first taste of Moo Cow Frozen Yogurt, I ended up fighting with my little one for that cup of frozen yoghurt that day. What followed after was that each time I spied a Moo Cow outlet while I am at the mall, I always made a beeline to get one. One for me and one for my little one… of course I can’t possibly share right? Not when something is so divine and healthy… wink!! When I receive the invite to join The Butterfly Project team to visit the Moo Cow Frozen Yogurt factory, I was literally jumping with joy. I was finally going to be able to peek into the art of making yogurt. So one fine Sunday morning, the eleven of us met up at one of the Moo Cow outlet at Publika at Dutamas. We were even given colorful Moo Cow t-shirts to change into before making the visit. Of course before heading off, we visited the Moo Cow outlet for breakfast yoghurt! All the Moo Cow outlets are design to resemble a barn in a farm. Super cute and very attractive! Now Moo Cow has increased their offerings from their frozen yoghurt and now offers Moo Cow Yogurt Drink available in three flavours. There’s the Original, Strawberry and Blueberry Yogurt Drink. Prior to this visit, I have already been buying these for my little one. The family loves the yogurt drink. We think this is one of the best yoghurt drinks we have tasted so far. Buy one for RM3.50 or buy 3 for RM10. 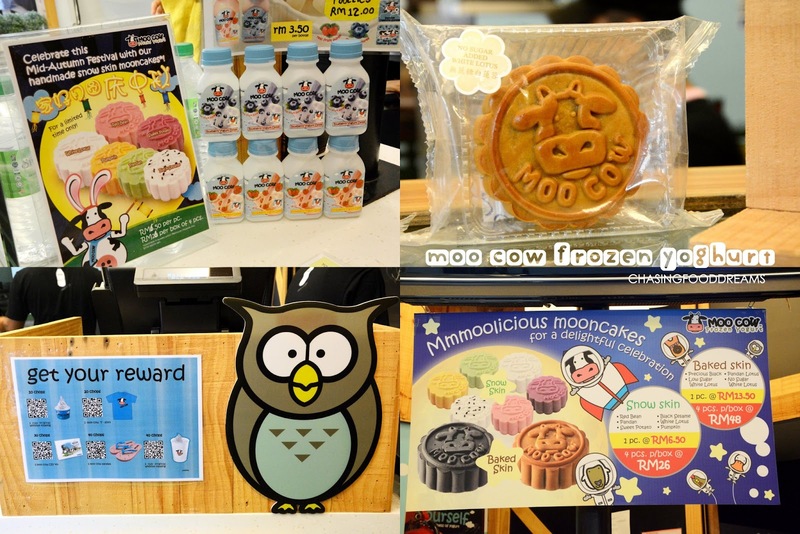 As it is mid-autumn season, Moo Cow was also offering super adorable Moo Cow Mooncakes. There are four Baked flavours and six Snow Skin flavours all made from their own bakery outlet. I was glad as we got to check these out later too so read on. After our breakfast yogurt drink, we packed up and head over to the Moo Cow factory located in the city. 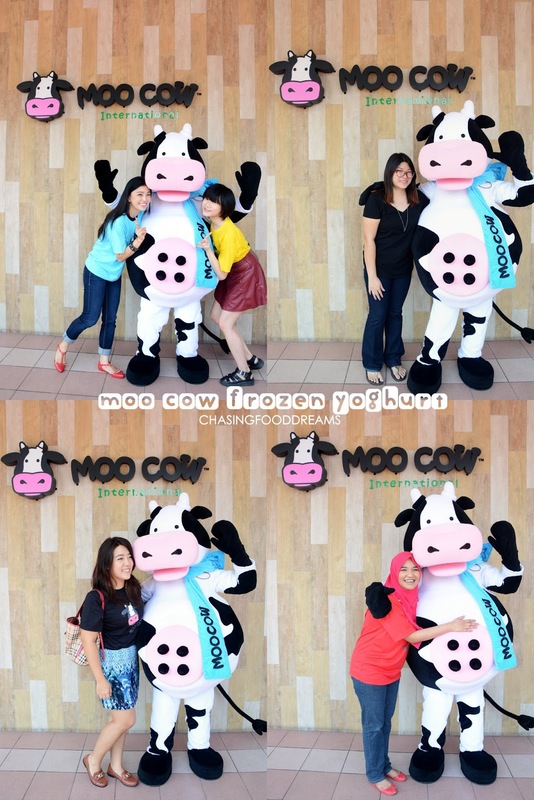 As soon as we reached the place which is situated in a row of shoplots, we were greeted by the Moo Cow mascot, Mamalia! Mow Cow factory occupies a shop lot and so we head up to the highest for the office. It was there that we were greeted by the Moo Cow team and the CEO of Moo Cow International Sdn Bhd, Clifford Too. Clifford took us through a little history on yoghurt and its benefits. Yogurt is considered the Elixir of Life in ancient Greek while it was called the Food of the Gods in ancient Indian record. Clifford quoted that history recorded that yogurt was accidentally created way back in 6000 B.C when travelers carried milk in pouches made from an animal’s inner part. While travelling, the milk actually got fermented and yogurt was discovered. There are several types of yogurt forms available today in different parts of the world. There’s the plain yogurt, Greek Yogurt (strained thick yogurt), flavoured yogurt, yogurt drink, froyo and even yogurt cake. Moo Cow opened its first outlet in Plaza Damas in December 2010. It all started when Clifford was just not satisfied with what was offered in the market. And so he took on the task to learn on how to make yogurt. Once the master recipe was perfected, he developed the recipe for mass market and also took on more research to inject various seasonal flavours into his froyo. Then Clifford went on to develop the marketing strategies for Moo Cow and came up with a Moo Cow family of animals and all the POPs and other adorable Moo Cow souvenirs. And then this is where the adrenalin kicks in as the whole lot of us got sanitized, capped and masked before we enter the production area at ground floor. Check out Clifford and his funky yellow boots! Clifford and his team proceeded to show us on how to make yogurt from scratch… the scientific way of course. Now we all know that yoghurt is so much healthier than ice cream despite both tasting equally delicious. Yogurt is made from milk while most ice creams are made from heavy cream. It is rich in calcium and the live cultures in yogurt works wonder with calcium to prevent osteoporosis. Yogurt is also rich in lots of other vitamins and essential minerals which are beneficial to our health. The best part about consuming yogurt is that is delicious and low in fat content so eat away and feel less guilty. There’s only one crucial rule in the art of making yogurt and that is never to stir the yogurt in a circular or whipping motion. Instead, we were told that we need to fold the milk and the active live bacteria culture or any kind of mixes. First of all, Clifford takes milk and warms it up to 80 C to ensure that the milk is pasteurized. Then the milk is then left to cool down to a temperature of around 40 C (give and take a few degrees). Add in the live culture that contains probiotic bacteria which is good for our bodies. One can simply buy a small tub of yogurt that contains the live culture to make your own yogurt. Now do the folding method to slowly lift and fold the culture into the milk. 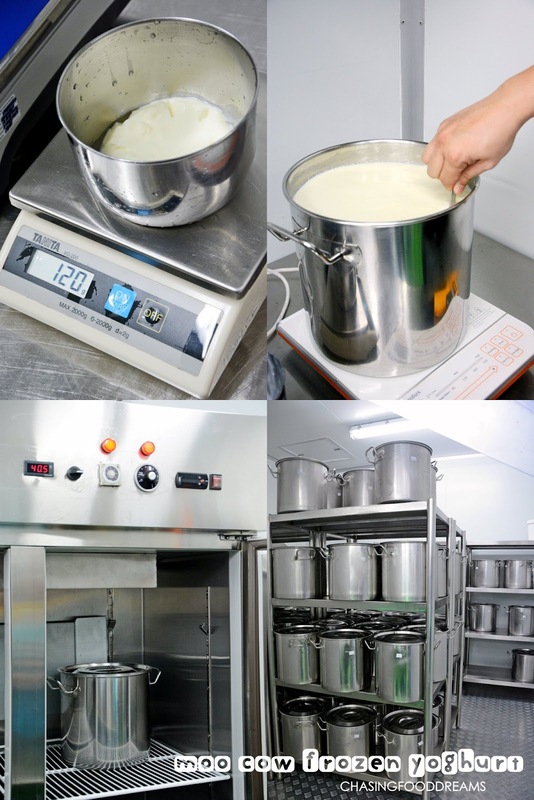 After the milk mixture is fully mixed, the whole pot is now left in an incubator for a minimum of 12 hours at a consistent temperature of 39 C to 44 C. This is the best environment for the live cultures to grow happily and set the milk to ferment. After the incubation, the yoghurt is still not fully ready for consumption as it may still be a little watery. The whole pot is now chilled between 0 C to 4 C for another minimal 24 hours to thicken the yogurt. After this process, the yogurt is now ready to be consumed or turn into the various yogurt products. My first taste of this awesome vibrant yogurt curd is pretty much amazing! Look at how thick and creamy the yogurt is and how well it has set. If I were to describe the texture, the yogurt made here is a tad softer than our local tau foo fah. I still can’t believe how creamy the Moo Cow yogurt is as it was only made from milk. We got to try this fresh batch of yogurt mixed with blue berries that sweetened and toned down the tartness of the yogurt. Still, I actually didn’t mind the tartness because it is so refreshing. Clifford proceeded to show us how to make Moo Cow’s Yogurt Drink. He measured a certain amount of yoghurt and added in warm water and a packet of his secret recipe that includes sugar and maybe some kind of citric acid and other ingredients. It’s just a wild guess from Swee San and me simply because it’s a closely guarded secret recipe. After folding the mixture a little, the whole pot is now blended by an industrial blender to combine everything together. The outcome is pretty much what we tasted in the Moo Cow Yogurt Drink except it was a little more diluted as it still needs to go through the process in the chiller to thicken up the drink. The final step would be to bottle them up and label them. Moo Cow froyo and yogurt drinks are made with all natural ingredients. We were also taught on how to identify natural ingredients and elements when buying yogurt as well. This is such an eye opener as many of us were really pleased to be able to finally understand that we should only consume natural ingredients that are made the right way for health benefits. The next time I buy yogurt, things will never be the same again as you can be assured that I will check out the ingredients that go into any product I buy! Here's Swee San making an attempt on the yogurt drink! After all the awesome demonstration of making yogurt and its products, some of us even got to have a go at making the yogurt drink. When everything ended, we head on back up to the office… it’s time to taste and enjoy a light lunch. After a light lunch, our dessert treat was an icy concoction of froyo with fruit filling and a dash of yogurt drink, Moo Cow Cheesecakes and Moo Cow Mooncakes. What a treat! 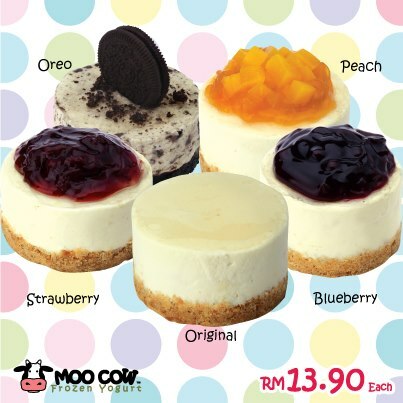 The Moo Cow Cheesecakes is available in five flavours of Original, Peach, BlueBerry, Strawberry and Oreo at RM13.90 each. I like how light the cheesecake texture is and how fresh the flavours are with the addition of yogurt. Moo Cow Mooncakes are really decent and delicious, especially the Snow Skin series. Baked mooncake offers four flavours of Precious Black, Low Sugar White Lotus, Pandan Lotus and No Sugar White Lotus at RM13.50 each or RM48 for a box of four mooncakes. Snow Skin offers classic down-to-earth flavours of Red Bean, Pandan, Sweet Potato, Black Sesame, White Lotus and Pumpkin. These are RM 6.50 each or RM26 for a box of four mooncakes. It was time to head home but I left happily with a greater knowledge of the science of making yogurt, along with the gorgeous taste of freshly made yogurt. Talking to Clifford also left me a lasting impression as he was thoroughly passionate on everything about his Moo Cow frozen yogurt. From now onwards, whenever I savor a Moo Cow froyo, I know that lots of love and effort has been put into this cup of awesomeness! *A big thanks to Tammy and TheButterfly Project for this visit.